I keep the jars in the stairwell leading down to the cellar, it’s quite dark there and I can look at them, neatly arranged on their shelves, every time I need a tin of tomatoes or a bunch of spuds. They all have labels, some decorated with water-colour images I painted, some just with the date and words of what’s in the jar. I will pick up a jar from time to time, asking myself if I should open it or leave it a little longer. Some of my cherry brandy dates back to 1999 and has become precious, if you get to try any or even receive a tiny jar with 2 or 3 cherries, you should know you’re on the top shelve of my cupboard.I love to buy fruit on my trips around England, most of the time I will end up preserving that fruit, to keep it for the colder months it is but also a memory of a lovely trip in a jar. A year ago I stumbled upon tiny little plums, so small they could be mistaken with a large black olive. 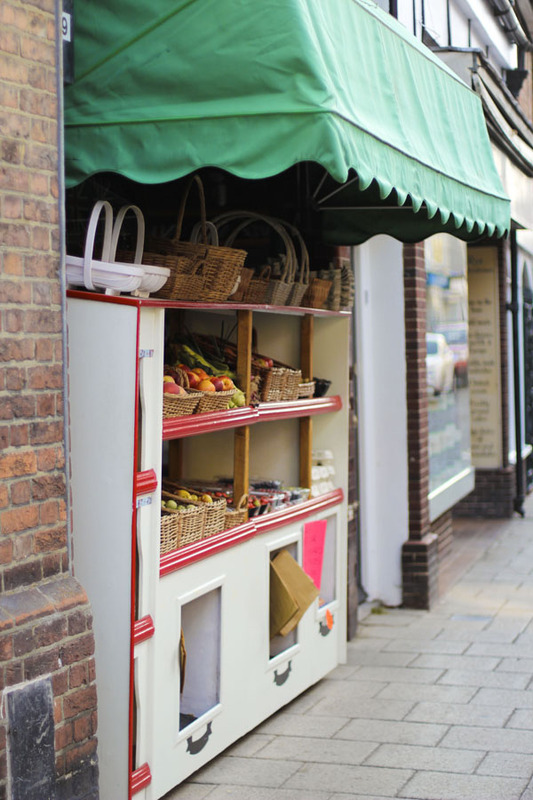 It was on an sunlit morning early in autumn, I walked passed the quaint greengrocers in the village I would dream to call home when I spotted the display of Damsons, Victoria plums and cobnuts. I wonder if the plums the greengrocer claimed to be native wild damsons are in fact sloes …I took home my brown paper bag of Sussex native wild damsons – at least I believe them to be damsons – and got busy at home making damson cheese on a rainy sunday morning. Damson cheese is an old country recipe, I can just picture the ladies using the leftover embers of the fire to stew fruit or dry flour for pastry. In my vintage cookery books, the writers suggest to leave the cheese for a few months, or even up to two years. One shouldn’t be surprised if it would dry out a bit, it is supposed to add to the flavour. 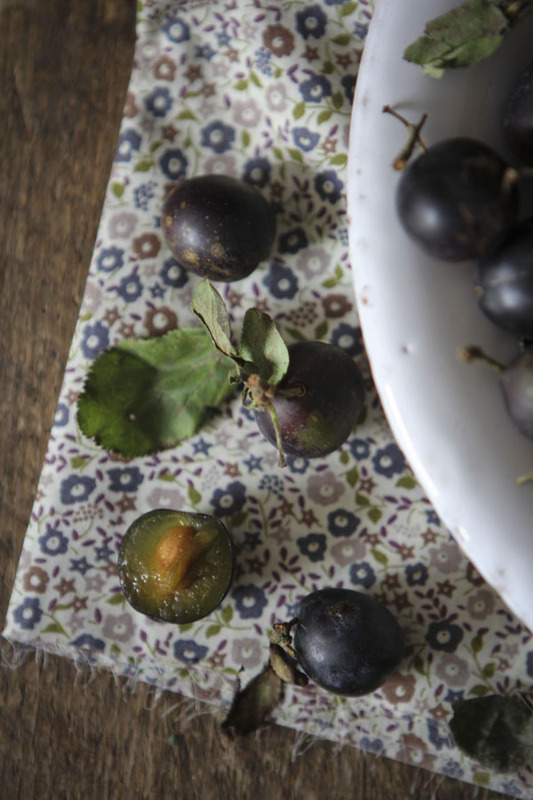 In her book Dorothy Hartley describes the original native damson as small with black bloomy skin and green flesh. The description sounds similar to how a sloe looks but if anyone out there can shed some light on what the native damson looks like, I would love to hear it. Set the damsons in a stone jar and put them ‘in the bread oven when the loaves are drawn’, (or in the modern oven, cook slowly, till the juice runs freely, and the stones are loose). Not having an old bread oven in my house, or a fireplace, I slowly cooked the fruit in the oven for 2 hours, in a stone jar, along with a cheap cut of beef that needed lots of simmering. I will try and get as much out of the heath of the oven as possible, remember my prunes to use in tarts? Energy is expensive and if you want to use cheap cuts of meat, the downside is the longer cooking time. Cover the fruit with the sugar, close the lid and place in the hot oven – ideally alongside your stew or some other dish that needs a long simmer. Leave the fruit to stew for two hours. After two hours, let the fruit cool in the jar and when it is cold enough to handle pass the pulp through a sieve and keep the stones aside. If possible – they can be one tough nut to crack – crack the stones, remove the kernels and ad them to the fruit. The kernels will give a note of almond flavour to the cheese. Pour the fruit pulp in a pan and bring to the boil until it jellies. Scoop the thick puree in straight-sided glass jars so they can easily be turned out. When turned out on a plate, the cheese would often be decorated with almonds and placed on the table as an accompaniment to stronger cheeses and meat. I have read of the custom of serving a glass of port with the damson cheese, or poured over it and served as a dessert on its own. The deep flavour of the cheese is wonderful with a strong blue cheese. 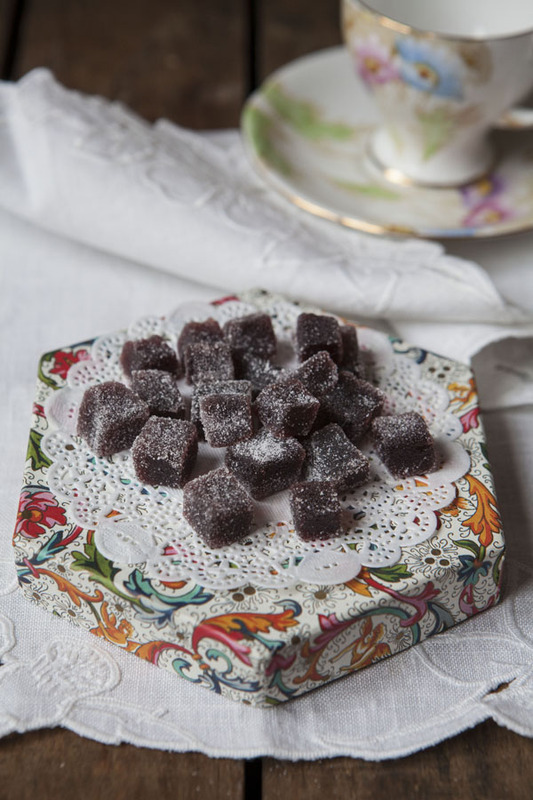 You can also create some sweetmeats by cutting the cheese in small cubes and then dipping them in fine sugar. An elegant little treat for the table or as a gift. Hartley suggests to leave the damson cheese for at least 6 months and mentions the flavour improves up to two years. I left mine for a year and the cheese was almost black and packed with a decadent plum flavour and a silky sensation on the tongue. 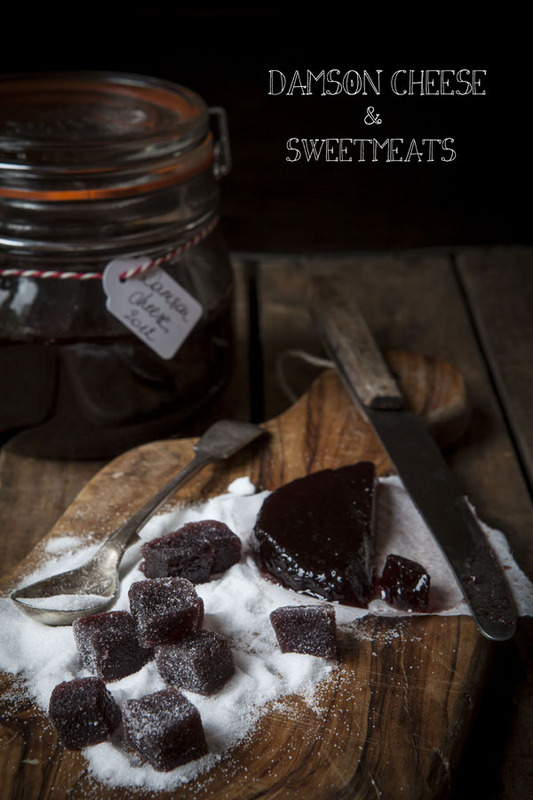 I made sweet meats that impressed my guests with their soft texture and delightful flavour. 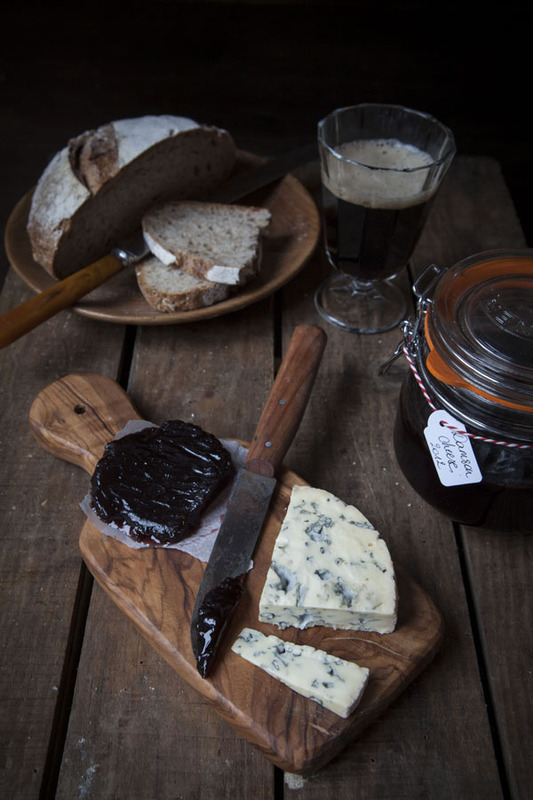 * I made damson cheese with the small dark plums as well as with a larger variety. The flavour of the smaller plums was slightly more intense. Memories through food are the best ones! Oh, mine! Those in your last picture remind me of Italian (Sicilian, to be precise) cotognata, a fruit preserve made with quinces… it's simpy delicious, but your preserve has to be amazing! Giulietta, I think this is actually quite similar if not the same as in Britain there is also quince cheese! I really should do more preserving and jamming. Beautiful photographs, so atmospheric. I haven't seen the usual amount of sloes or damsons this year but yours does look very good. They sound like damsons alright, just like little bluish-black mini plums with a whitish bloom not dissimilar to that on sloes. Trust me, if they were sloes, you'd know it at your first taste of the mouth-puckeringly astringent flavour of sloes – sloes add impact and flavour to liquer but have no sweet character of their own.